Middletown, Ohio, January 24, 2017 – NuWaves Engineering, an international Radio Frequency (RF) and Microwave solutions provider, announced the addition of their latest miniaturized bidirectional amplifier to their line of NuPowerTM XtenderTM bidirectional amplifier products. The NuPower™ Xtender™ 12C04A model, part number NW-BA-12C04A, provides 15 watts of RF power across L- & S- band frequencies of 1.0 to 2.5 GHz, ideal for extending the communication range of half-duplex transceivers with constant-envelope waveforms. Adjacent radio frequency bands, such as the popular 900 MHz Industrial, Scientific, and Medical (ISM) band are also supported at lower peak power levels. In receiver mode, the 12C04A bidirectional amplifier offers a low noise figure of 3.5 dB and a low noise amplifier that provides 13 dB of gain. The module accepts a +5 dBm input level and provides a minimum 35 dB of transmit gain, all while operating with 30% or better power efficiency. This bidirectional amplifier features the option of manual transmit / receive (T/R) mode selection or automatic transmit sensing, coupled with an extremely fast T/R mode switch time of <1.5 μs to support a variety of digital data links, including AeroVironment's DDL, FreeWave Technologies' radios, and Microhard Systems' radios. All of this has been designed into a system with a small form factor of 6.9 in3 by utilizing state-of-the-art Gallium Nitride (GaN) power amplifier device technology, the NuPowerTM XtenderTM 12C04A bidirectional amplifier module is ideal for broadband RF telemetry and communication systems that require reliability and minimal size, weight, and power consumption (SWaP). "We are excited to offer this bidirectional amplifier module. This product is targeted at the unmanned aircraft system (UAS) market, filling the gap in the market for small bidirectional amplifiers," said Jeff Wells, President and CEO of NuWaves Engineering. "The NuWaves' team takes pride in our ability to support our clients with best-in-class RF solutions, rapidly fulfilling the ever-changing needs of the Warfighter." NuWaves Engineering is a premier supplier of RF and Microwave solutions for Department of Defense (DoD), government, and industrial customers. An RF engineering powerhouse, NuWaves offers a broad range of design and engineering services related to the development and sustainment of key communications, telemetry and electronic warfare systems, as well as a complete line of commercially available RF products. NuWaves' products include wideband frequency converters, high-efficiency and miniature solid state power amplifiers and bidirectional amplifiers, high intercept low noise amplifiers and miniature RF filters. NuWaves Engineering…Trusted RF Solutions™. The NuPower™ Xtender™ 12C04A is currently available for same day shipment when you place an order. NuWaves Engineering is a premier supplier of Radio Frequency (RF) and embedded systems products and solutions for DoD, non-DoD government, and industrial customers. 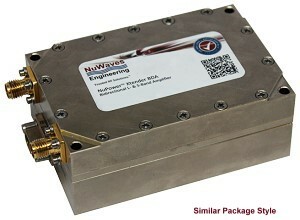 An RF engineering powerhouse, NuWaves offers a wide range of engineering design services focused on wireless communications, as well as a complete line of commercially available module-level products, such as wideband RF upconverters and downconverters, high-efficiency miniature solid state power amplifiers, high intercept low noise amplifiers, miniature RF filters, and fiber optic RF distribution modules.